The Kew Calendar for June has a really cheerful piece of art by Betty Swanwick. It dates from 1937. Once again we are implored to get there via Kew Gardens Station and informed that it’ll cost us one penny – an old penny – to gain admission. These days, typically, the cost of entry is £14. This is a huge increase. If we look at the highest conversion of the old penny to current times at comes out at just over £1. Let’s just say that it used to be very cheap. My own garden isn’t at its best in June but here are some blooms from my patch. I think these are granny’s bonnets. They grow like weeds but who cares. I think they are lovely. Whatever these are, they do well. These remind me of the bells I ring, complete with clapper. Here are some pictures from 1964 when I was a teenager. I certainly won’t say I was a rebellious teenager. In fact I feel I had little in the way of boundaries to rebel against. My mum was already suffering from cancer, which she died from 1n 1967. My dad’s job meant he was often at home during the day but out in evenings. I had a free and easy time. By 1964 a degree of financial security had reached the family and my dad had been able to acquire a brand new vehicle which he felt was essential for his job as a touring (extra-mural was the term used) lecturer. He felt a garage was needed to house the vehicle which was a Bedford Dormobile. 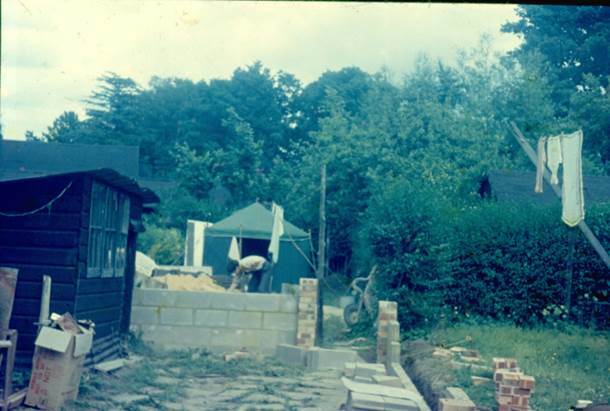 The first picture shows garage under construction, but still housing the old black shed. One of our camp tents has been put up down the garden to act as storage. The shed was a wonderful glory hole. Grandad had been a cobbler and we had some of his old gear. My dad was a keeper and hoarder (Yippee!) so we had an awful lot of old tins filled with anything that might be useful. 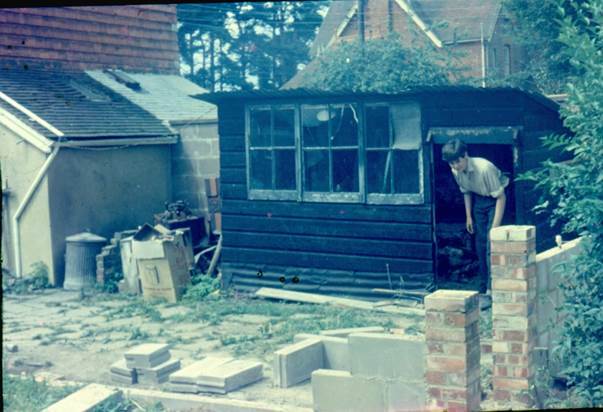 I loved that shed and only now, looking back do I realise how small it was. By the way, that’s me leaning over twixt garage under construction and the tent. The interior of the garage still has dad’s crazy paving down. I remember these stones being bought at a local house clearance auction and they served us well (and still exist, of course). Here we see me leaving the shed. Yes I was quite tall, but I have no memory of the shed door being quite so low. The lean-to on the house on the left was the bathroom which had, originally been an outhouse. Next to it, where you see the dustbin had been our coal store and the area between lean-to and shed had been covered by a corrugated metal roof supported on poles. It had also been used for storing our bikes. Beyond our shed I see the house at the local garage and petrol station. Now there’s an idea for another blog! But meanwhile I’ll remember that shed with huge affection. 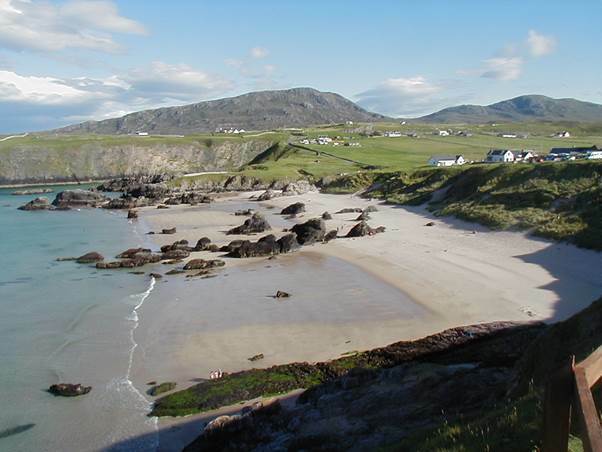 Back in 2004 we camped at Durness on the north coast of Scotland. If you want beauty and a stunning beach then you can’t beat Durness. 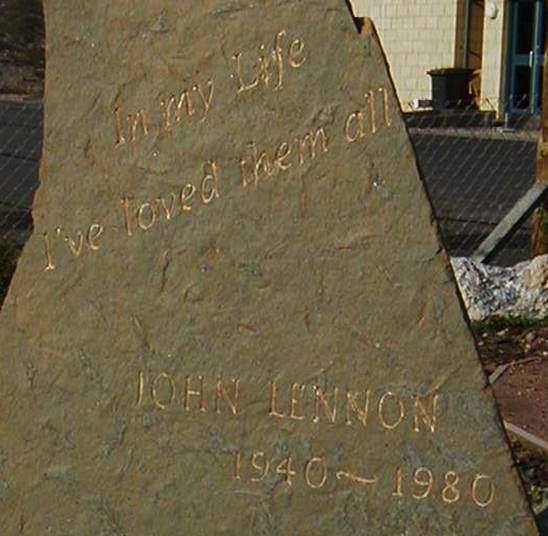 We did not know, before we visited, that Durness had been a childhood holiday haunt of John Lennon. Now I am firmly of ‘The Beatles’ era. I’d have been 14 when we were all singing, ‘She loves you, yeh, yeh, yeh’. I was a student when The Beatles were in their more hippy phase and by the time the dream was over I was just about a working man. Of the foursome, John, was always a favourite. He was wholly non-establishment and I applauded his way of thinking. Good on you, John. Of course, John was the first to die, back in 1980 when he was shot. It may sound odd, but I was angry with him when this happened. You see my brother died at much the same time and when, it seemed to me, my brother’s death should have been the centre of people’s thoughts, it was John Lennon who actually was. Of course, I came to forgive him for allowing himself to steal all the news at that time. It’s strange how the human mind works at times of grief. 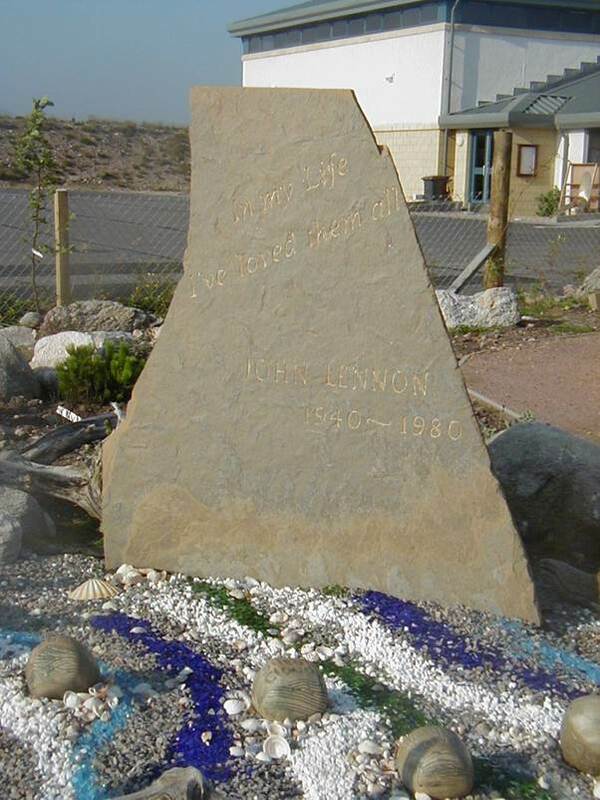 We were amazed to find that at Durness there is a John Lennon Memorial Garden. You see John, in his life, loved Durness, his holidays with his aunt who raised him and having cousins around. He loved it so much that he wrote the song, ‘In my life’ really about Durness. This stone sums it up. 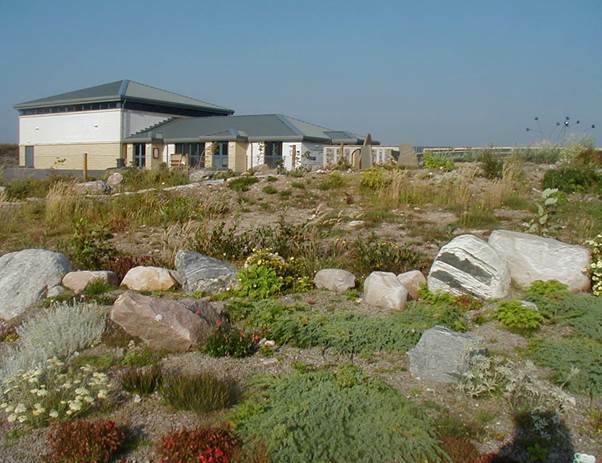 There’s the garden which in potentially wild, windswept and sea salt sprayed Durness runs to only those plants that will thrive in such conditions. As you can see during our Durness sojourn we had none of those wild conditions. Here’s a view over the beach at Durness. Dad was an enthusiastic gardener. He explains some of his early gardening influences in his own reminiscences, completed shortly before he died in 1996. …The southern end where the triangle narrowed was Uncle Joe’s kitchen garden which he had nursed since before I was born. The picture I carry in my mind of text- book perfect rows of vegetables may be larger than life, but it persists. I remember in particular rows of peas coming on in succession as gardening books say they should, including tall varieties, 2 metres high, covered with well filled pods. Dad never grew tall varieties partly, I think, because he could not afford the necessary pea sticks but mainly because they produced a luxurious excess when vegetables were plentiful and he was concerned for continuity- for crops in difficult periods -late winter and early spring. That described as time in the 1920s. By the 1990s, dad had got more experimental and took to growing unusual vegetables. Sometimes he saved seed and passed some to me. Here are a couple of examples. 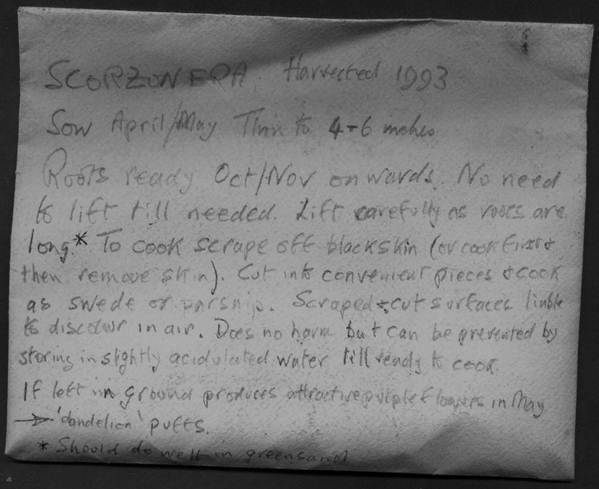 Here we have a packet containing scorzonera seed which he saved in 1993, along with cultivation and cooking instructions with an added comment that it should do well on greensand. He, of course, knew that where I live I have a greensand garden. The other example I have is asparagus pea. 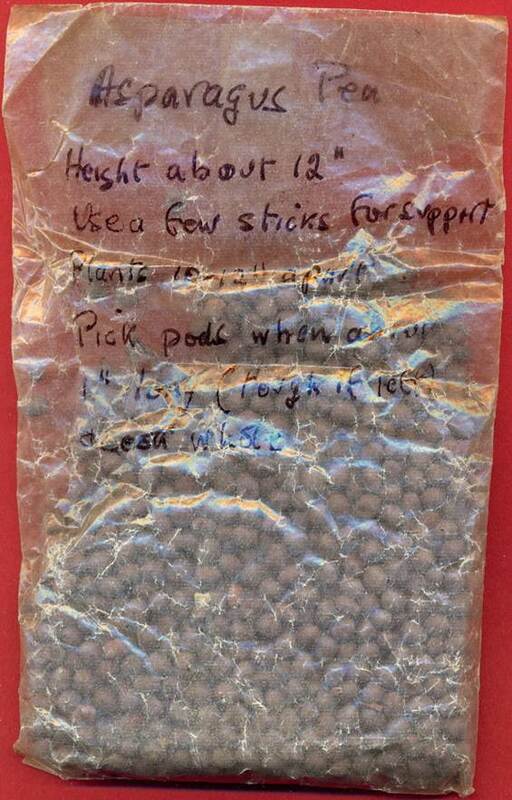 These are in a clear packet so you can see the seed as well as cultivation and cooking advice. These are members of the pea family producing pods that have a reptile look about them with an asparagus flavour. Maybe we ought to try a few of these. Actually, it is good to have preserved these bits of dad’s gardening past which also show him with a thoughtful and very kind nature.